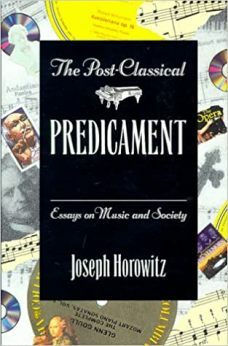 Joseph Horowitz's The Post-Classical Predicament explores the dilemma of classical music in America's changing society. Around the turn of the century, argues the author, classical music was integral to general intellectual discourse and to the contemporary moment. This integration of music and society began to break down during the interwar decades. A new, enlarged audience was tutored to disdain contemporary and American culture in favor of pedigreed Old World masters. In a period when jazz became America's most individual, most influential musical export, the music appreciation movement shunned popular music as a menace. To the schism between musical and intellectual life, between audience and composer, was added a schism between highbrow and low. After World War II classical music became increasingly marginalized - a form of popular culture masquerading as high culture. Ultimately, great music and great performers became captives of their own celebrity. In this sterling collection of essays, Joseph Horowitz ranges from the turn-of-the-century achievements of Dvorak, Seidl, and Ives to the distorted careers of Vladimir Horowitz and Leonard Bernstein a century later. His other topics include Glenn Gould, Amadeus, and Forest Lawn Cemetery - where classical music rests in peace as mortuary kitsch. The collection concludes with the author's reflections on his own experience as Executive Director of the Brooklyn Philharmonic Orchestra - whose recent weekend festivals aim for a revitalized “post-classical” music exploding the traditional formats and boundaries. Horowitz (Wagner Nights) is one of the few contemporary music critics who are also involved in the creation of music - in this case, as executive director of the Brooklyn Philharmonic. He therefore has an exceptionally keen sense of where serious music fits into America's cultural life, and the best of these pieces reflect it. He writes perceptively, for instance, of the facile “midcult” appeal of the Mozart movie Amadeus, compared to the real musical and dramatic points made by Ken Russell's much less highly regarded The Music Lovers, on Tchaikovsky. He subjects the career and iconic stature of Vladimir Horowitz to the same kind of piercing scrutiny he gave Toscanini's reputation in his book Understanding Toscanini. He is observant and sympathetic on the changes over the years in Leonard Bernstein as musical educator, and a brief essay on Nathan Milstein perfectly enshrines that aristocratic fiddler's appeal. Certain pieces, on the staging of Wagner, on the Viennese fin de siecle as reflected in Klimt and Mahler and on Dvorak's potential and actual impact on American music, are more specialized. Joseph Horowitz's wide-ranging interests, however, and his concerns with issues seldom explored, make any collection of his essential to a serious music-lover. Of the 13 pieces assembled here, two are original and the others are reprinted from the New York Times, Opera News, etc. A seasoned music critic, current executive director of the Brooklyn Philharmonic, and award-winning author, Horowitz (Understanding Toscanini: A Social History of American Concert Life, LJ 12/86) has drawn together a selection of 13 essays spanning a period of 15 years. Written in an exemplary style, this interesting mix includes a study of the movie Amadeus; profiles of performers Vladimir Horowitz, Glenn Gould, and Nathan Milstein; commentary on the brain drain of German and Austrian musicians into the musical life of America; a tribute to Busoni; a review of the staging of a Wagner opera; and a discerning examination of the incongruity of playing music at Forest Lawn Memorial Park in Glendale, California. By probing the interrelationship of music and society and providing a keen insight into the inner working of genius and its play on society, Horowitz gets to the soul of the individuals and the music he examines. Highly recommended for all serious music collections.